I think this card is gorgeous, too. The touch of pink with the striking black really makes it a stand out. 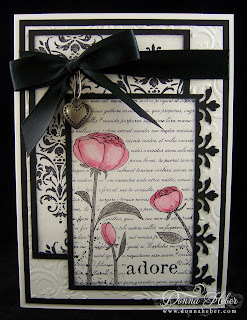 I used black in my last card and really liked the look.. Great job, Donna. Hi Donna! Your card is stunning. These colors are beautiful together! The ribbon and charm bring it all together! So pretty! Donna, this is just stunning. Gorgeous design and wonderful color combo. wow donna this is gorgeous, what a elegant card. your stamp is wonderful with those roses on it. This is a beautiful, beautiful card. So elegant. Thank you for sharing. Donna, my jaw dropped when the photo loaded! OMG...total wow! I love thIs card too!! The charm is the perfect touch. Very pretty Donna. Love the pop of color. Classic, lovely card. Lovely! 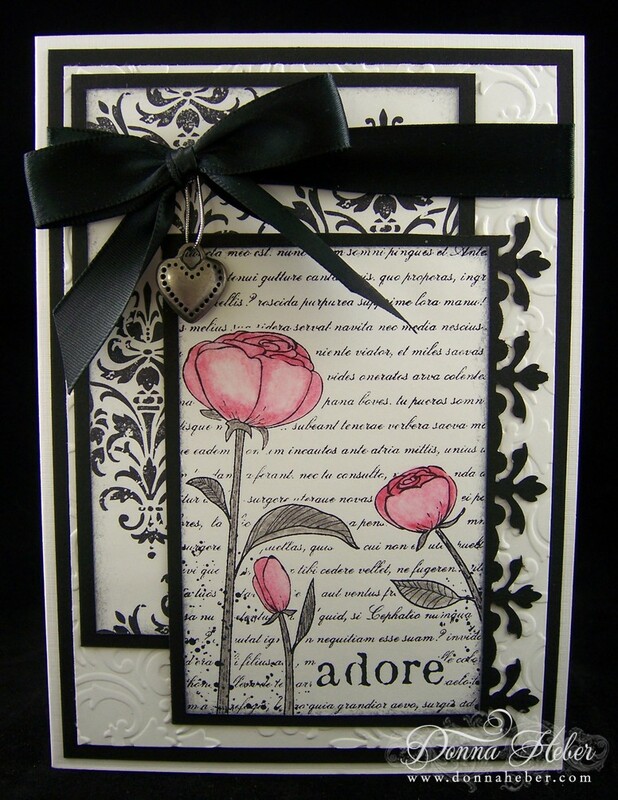 The black and white with the pink flowers is awesome! Oh love the soft pink flowers against the black and white! I can see why it is a favorite of yours! beautiful! This is such a beautiful card- I had to leave a comment! I love the splash of pink amid the black and white! Lovely card! What an amazing card. I love all of the details that you have incorporated. Stunning card! The color combo is lovely and the layout is terrific! This is gorgeous!! Those pink flowers just look so cool in the black and white.